Rabbi Moshe Schreiber was a renowned Orthodox rabi and scholar. Born in Frankfurt am Main, he became Chief Rabbi of Pressburg, today Bratislava, in 1806. Strictly Orthodox, he spearheaded traditionalist response to modernizing changes in Jewish society and headed a yeshiva in Bratislava that was considered one of the most prominent centers of traditional Jewish learning in Europe. The beginnings of the famous cemetery date back to the 17th century, when Jews were allowed to settle on the estate of the Pálffy Counts. The site served for centuries as the burial place of the Bratislava Jewish community, but it was destroyed in 1943, when the nearby tunnel was constructed. 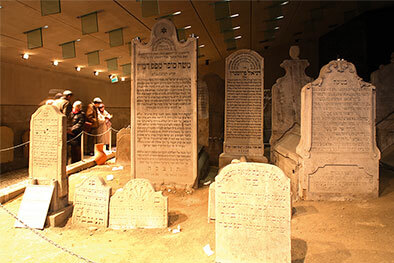 Only the most precious section, with 23 graves surrounding the Chatam Sofer’s tomb, was preserved, encircled by a concrete shell and covered with panels. In 2000-2002, after decades of neglect, the whole site was redeveloped and the gravestones were restored. The Architect Martin Kvasnica designed a striking new complex that adheres to the strict requirements of the Halakhah (Jewish law) as well as to the highest standards of contemporary architecture. The unique architectural monument forms part of the Slovak Jewish Heritage Route. Hours: No regular opening hours, but groups and special visits can be arranged through the Jewish Community of Bratislava.